As coy as Jon Klassen, Murguia is a master of subtlety...Murguia's muted pen-and-ink-and-watercolor illustrations, presented almost entirely on double-page spreads, create a lush cartoon world. Careful readers might notice a final hint in the form of a lizard that just might be a dragon—a brilliant punctuation mark to this open-ended story. Spellbinding read-aloud gold. The narrator’s tongue-in-cheek obliviousness slides easily into an affirmation of the power of imagination...The musing text, with its questions posed to the audience, will be a hit at storytime or during a lapsit, and the invitation to believe the impossible makes this a wonderful segue into encouraging kids to make up their own fantasy stories. “Hey, look—it’s a horse in a hat,” opens this irreverent picture book from Murguia (I Feel Five! )...With its minimal text and wry visual jokes, this playful offering offers good fun. 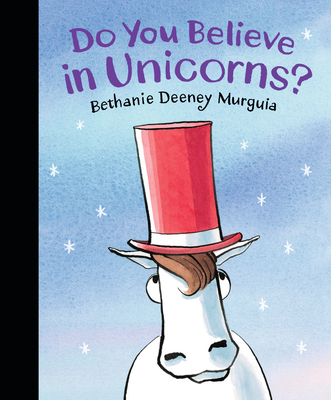 This charmer of a picture book makes a strong case for the existence of unicorns by juxtaposing a skeptical narrator with the action of the story itself...A fun take on belief and magic.